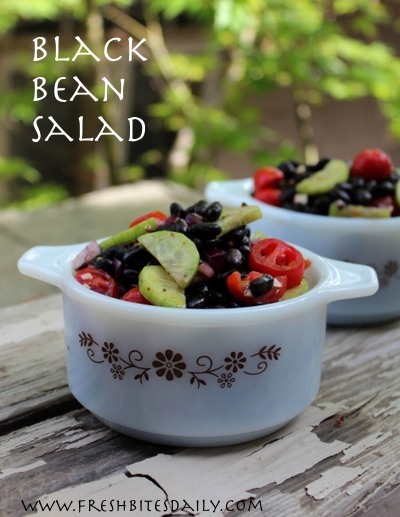 This simple black bean salad is great for entertaining and potlucks. It turns heads because of the beautiful colors and the heady fragrance. 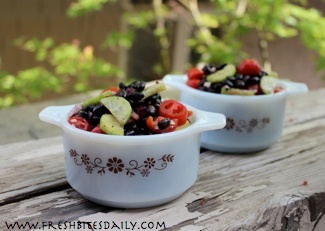 Black bean salad is a great travel food and addition to the lunch box. Just keep in mind that the flavors are best at room temperature. If you just did not get around to cooking those black beans, two cans will work with this recipe. For best results, soak your beans the night before you cook them following our instructions for soaking beans. For maximum flavor, cook them in bone broth as well. Mix the beans, cucumber and tomato in a large bowl. Heat 2 tablespoons of olive oil in a heavy skillet and saute the red bell chunks until they just begin to brown. Add the garlic to the saute skillet. Stir continuously for about two minutes while the garlic roasts. The only way to add this much garlic to a salad is to cook it in some fashion. Otherwise the pungent fresh garlic would overpower the salad with fragrance and heat. Yes, raw garlic is hot! Pour the peppers and garlic over the bean mix and toss thoroughly. In a small container mix the remaining 4 tablespoons of olive oil, juice and rind of the lemon, basil, salt and pepper. Pour this dressing over the bean mix and toss thoroughly to coat every bean and bit of vegetable. Let the salad sit for an hour for the flavors to blend. 3 Comments on "Your go-to party and potluck black bean salad"
I make a similar salad with black beans, green onion, green pepper, chili pepper of some sort, cilantro, and garlic, dressed with olive oil, lemon juice and rind, salt and pepper. I have been looking for an easy salad recipe and landed on your blog 🙂 can’t wait to try this! understanding anything fully, however this piece of writing presents good understanding yet.